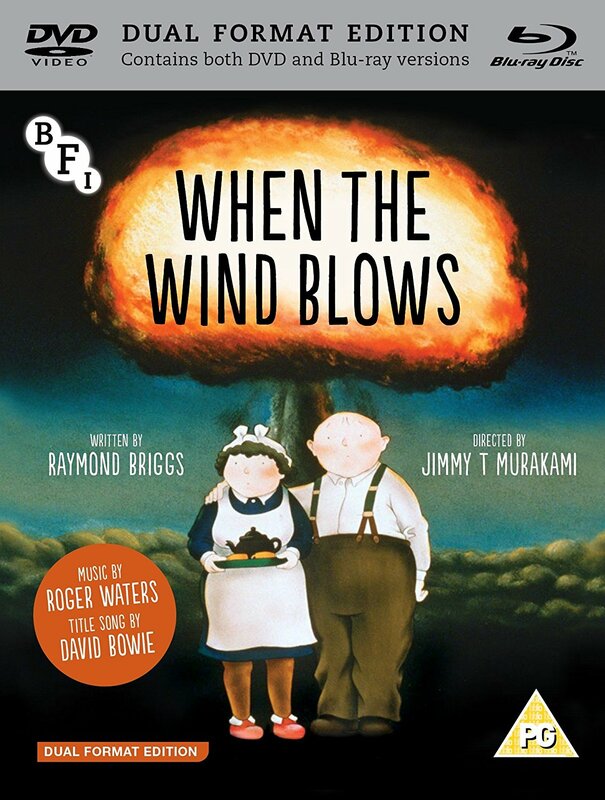 Later this month (on January 22nd), the British Film Institute (BFI) are releasing When The Wind Blows on Blu-ray/DVD in a Dual Format Edition, packed with special features including interviews, a making-of documentary and the public information film Protect and Survive (1975). 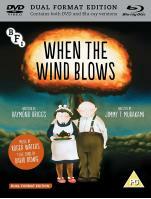 When the Wind Blows is a touching story about love, tenderness, humanity and hope in the face of nuclear war. Adapted by Raymond Briggs (The Snowman) from his best-selling book, it features an original soundtrack by Roger Waters, and a title song by David Bowie. Released during a decade when the threat of nuclear war became a chilling, and distinct possibility, When The Wind Blows brought the thoughts, fears and behaviour of a very normal, elderly couple, into sharp relief. Focused on James and Hilda Bloggs (wonderfully voiced by Sir John Mills and Dame Peggy Ashcroft), a retired couple in Sussex, on the south coast of England, the story starts with the country on the verge of war. James arrives home from the local library armed with the official government advice leaflet ("Protect and Survive") which made laughable suggestions such as using internal doors, propped against walls, to act as shelter from missile strike. Ever trusting of the powers that be ("We must do the correct thing", a frequent comment), James complies with every aspect of the guidance, as futile as they seem to the observer - even down to a mild panic over not having any peanut butter as specified in the leaflet (despite neither liking it). The dark humour of the first part soon gives way to an achingly sad, and thought provoking, narrative, once the attack has happened. At times tough to watch, the couple's naivety and devotion to each other, right to the end, is very touching. The film was created in a blend of styles, which complement each other well and give a very special feel to it. Much is conventional animation, but this is sometimes sparingly overlaid onto 3D model work, and on occasion, real news footage is used. There's also a small amount of stop-motion animation. The soundtrack is perfectly weighted - much of the time, particularly after the attack, there is no sound other than the lead characters' voices. At times, some atmospheric notes are used - sparingly - such as when the pair are collecting radiation-laced rain water. At other points, music - much of it created specifically for the film - can be heard. Bowie's title music is an obvious starting point; tracks by Genesis, Hugh Cornwell, Squeeze and Paul Hardcastle are hard to pick out, used as incidental music playing on the couple's radio in the background. The lion's share of the music though was composed by Roger Waters (who thought the original graphic novel by Briggs was "staggering"), and performed by him and his Bleeding Heart Band (including Jay Stapley on guitar, Mel Collins on sax, Clare Torry on vocals, and Paul Carrack, who next appeared on Roger's Radio KAOS project). The little-known, and overlooked, soundtrack by Waters has a number of fans, as it should: it's not a throw-away effort with little relevance to the film itself (unlike one or two of the other songs on the soundtrack) and is truly worthy of investigation if you are yet to hear it. If you consider it comes on the heels of Roger's Pros and Cons album, and explores some of the ideas that The Final Cut touches on, that should drive some of you who may have been unaware of his work on this soundtrack. Roger really did some wonderful work on this soundtrack, beautifully bringing in some of the dialogue to superb effect (such as on Hilda's Hair). Visually, a great job has been done with the source material, with the Blu-ray presenting it at its best. The colours were always muted - a design decision as befitting the story - and the soundtrack has excellent clarity throughout. Recorded in Dolby stereo, music and dialogue both are presented very clearly. One of the Blu-ray/DVD extras included is an 'isolated music and effects track' which strips out all the dialog, and makes for an interesting viewing experience. Elsewhere there's an audio commentary by first assistance director, Joe Fordham, which explains the background, and also how audiences in various countries reacted to the film. There's a fascinating 25 minute "Making Of" from the year the film was released, a more contemporary interview with Briggs from 2005, and feature length documentary about the film's director, Jimmy Murakami. Completing the extras is an original, 50 minute public information film from 1975 explaining what nuclear attack would mean for the populace, and how to "Protect and Survive". The film was designed to be shown in the event of an imminent attack, and one wonders how effective (or possible) some of the instructions would be. Sobering stuff. Needless to say, this new release from the BFI (British Film Institute) is heartily recommended; the film is a lesson in effective storytelling and presentation, and the addition of the Roger Waters score/soundtrack is going to be a clincher for some. There was a similar (very limited) release at the end of 2014 through one online retailer - this is broadly the same, albeit made much more available. To order your copy now, for despatch upon release, please use these direct links: Amazon UK, Amazon France, Amazon Germany, Amazon Spain and Amazon Italy. Please note it is NOT currently listed in the US or Canada, but the above alternative retailers will ship worldwide. Using our Amazon links also helps us hugely with ongoing site running costs and we really appreciate it!